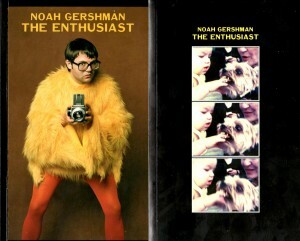 Noah Gershman’s poetry collection The Enthusiast comes with two sides, and I don’t mean Asian coleslaw and potato wedges. No, The Enthusiast comes with a Side 1 and a Side 2, kind of like a mix tape but not because it’s a book, you dig? So from a production standpoint this book is great fun straight off. It comes with a requisite inversion because once you’re done with Side 1 you have to literally flip the badboy over and begin at the second cover to get through Side 2. It’s like the two sides are eating their way through the pages to get to the gooey center of the book, which brings us to the text itself. And guess what? It’s really, really fun. “Never argue with a skeleton. of a sturdy yellow truck. In the latter work there’s a great sense of real-life guilt and fear behind the thunderous imagery. It’s a fine showcase of Gershman’s skill on the poetic tightrope; man’s got some solid balance and nimble feet. Near the mid-point of Side 2 comes a piece that I felt really distilled the essence of the entire collection. It lumps together a rag-tag group of “cutthroats, buttheads, slumlords, buzzkills, murderers, burglars, scumbags, chumps, scoundrels, lunatics,” etc., and places them in what could be considered a sterile, normal setting otherwise known as Brunch. The result is warm and funny, and it reminds us that those who exist on the fringe are still very much human.